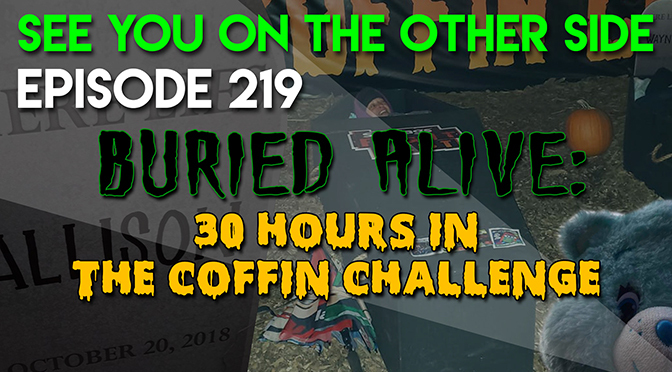 On October 21st and 22nd, Allison Jornlin from Milwaukee Ghosts participated in the Coffin Challenge at Six Flags Great America outside of Chicago, Illinois. 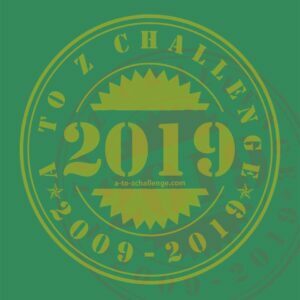 What was the challenge? Allison texted me about it a couple of weeks ago and she was incredibly excited to be part of it. 3000 people (including me!) submitted to be chosen for the coffin challenge and spend those 30 hours in the Northern Illinois cold in a casket. Six people were chosen and my sister made the cut. And that’s where Allison started losing it. Sleep deprivation is a classic way of torturing people and making them want to give up, and we’ve seen it in fiction from Lost to A Clockwork Orange. This night she was tormented by the Six Flags workers as well as a little nightmare ear worm (as many beleaguered parents can attest to, including myself) called “Baby Shark”. That was put on blast for the coffin challengers from 3 to 4am. The Sunspot song this week uses the metaphor of being buried alive to talk about the ways that we can create our own “Cask of Amontillado” through lies and self-deception. When you lie, you have to pile on more and more in order to avoid being caught, and after awhile it just feels like you’re “Buried Alive”! the barrel of a gun. only as good as your latest alibi. left in a hole where you’ll never see the sky. 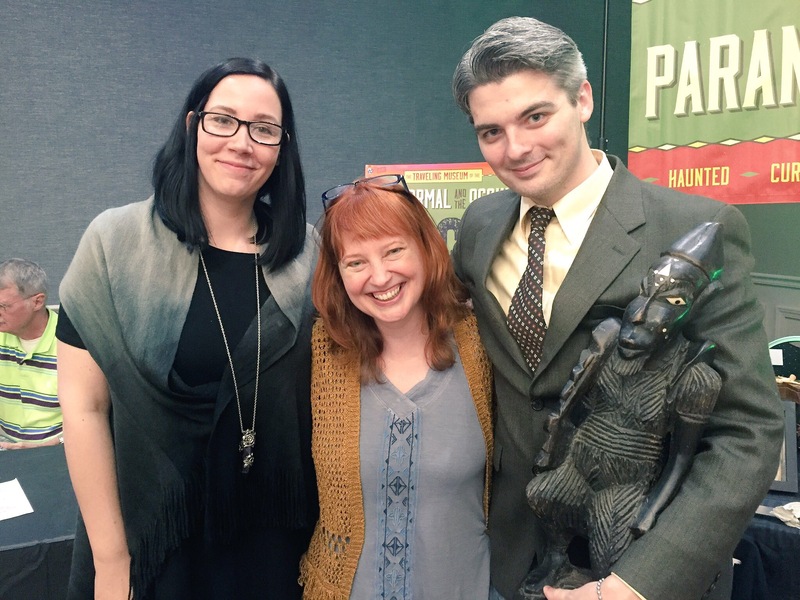 This weekend Allison from Milwaukee Ghosts, Wendy, and I had the privilege to attend the 2016 Haunted America conference in Alton, IL run by one of the Midwest’s spookiest storytellers, Troy Taylor. 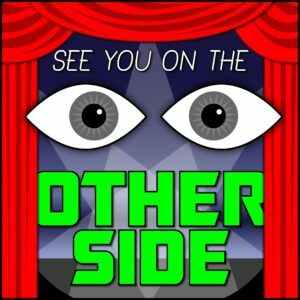 See You On The Other Side meets Haunted America’s Troy Taylor! We’ve been to Alton, Illinois before. 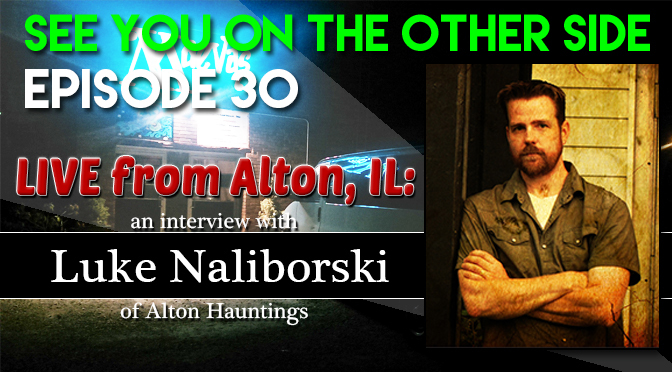 In episode 30, we interviewed one of the area’s haunted tour guides, Luke Naliborski in a live podcast/performance! 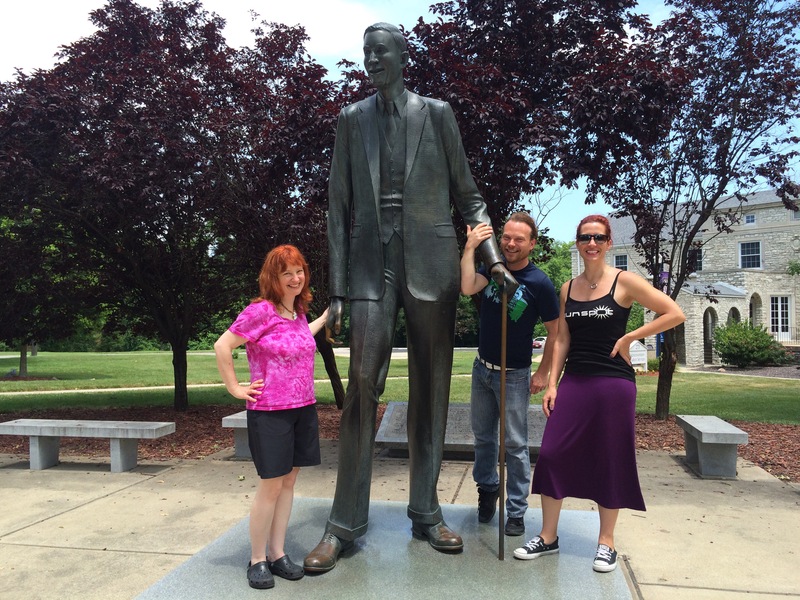 It’s a small town on the Mississippi River known for being the birthplace of Robert Wadlow, the tallest man in history at 8 feet 11 inches tall! Known as the Alton Giant or the Giant of Illinois, Wadlow was known for his gentleness, but sadly died at only 22 years old. Both Sufjan Stevens and Andrew Bird have played songs about him. But we weren’t there just to feel short, we were there for ghosts, spirits, and all the weirdness that we could handle! Friday night, we got in pretty late so we missed the first panel, but we did make it in time for the masquerade ball. 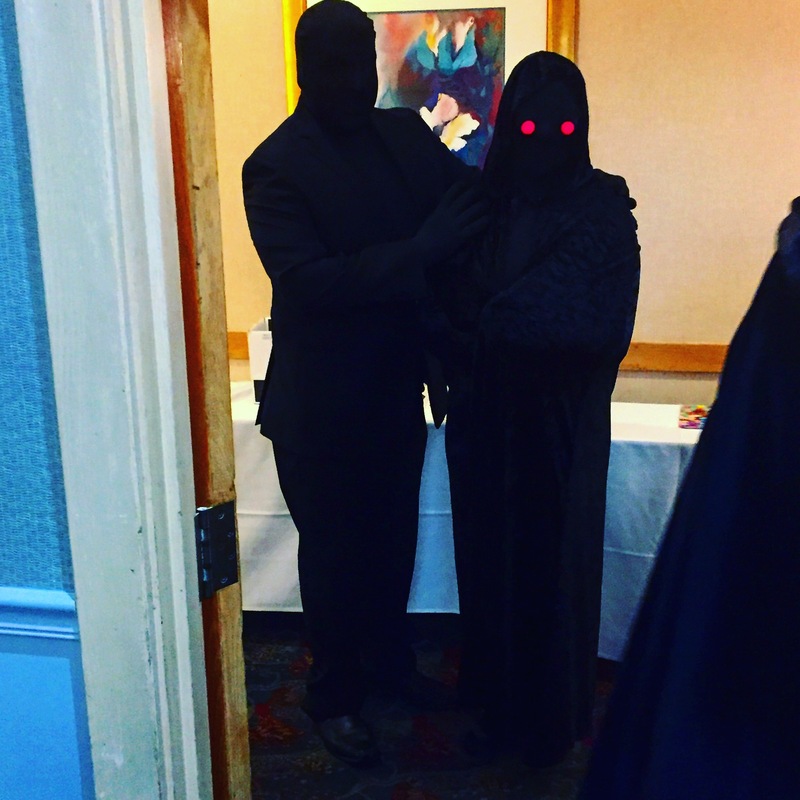 Hands down, the best costume was the shadow people. At the party, we all got to share some stories of paranormal experiences and that was a lot of fun, but my favorite was the theory that “The Titanic was an inside job”! I had never heard that one before, so it was fun to learn a new conspiracy theory. Shadow people dressed up at the masquerade ball. I turned the contrast up a bit in the pic, but that’s pretty close to exactly what their costumes looked like. Pretty good, huh. I think they might have actually been Shadow People. 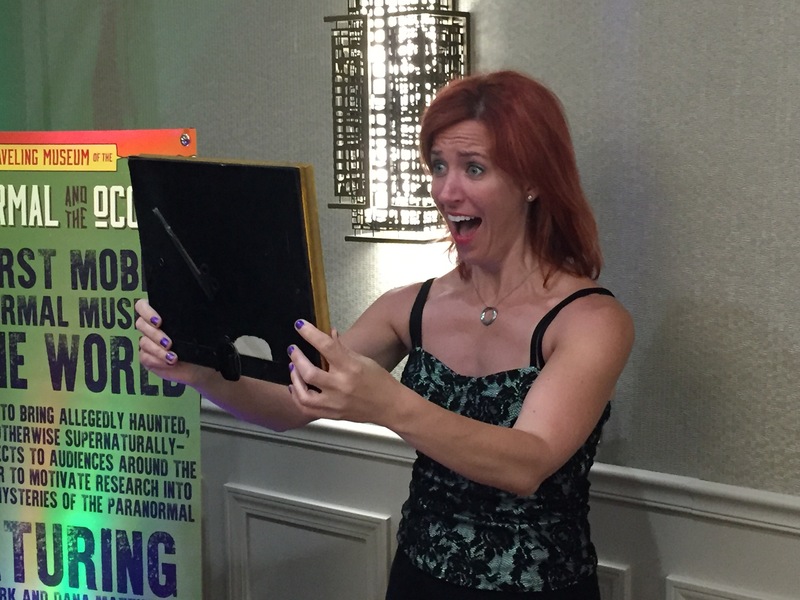 Up next was Paranormal Sarah , who we also saw at the Paradigm Symposium in May, but this time she focused more on the psychology of why we are attracted to the paranormal. 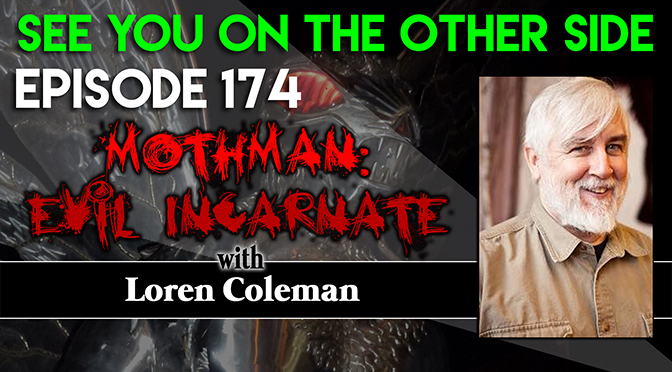 Rosemary Ellen Guiley took the stage after that and you’ll have to listen to this whole episode to really get our take on it. I’ve been, of course, a fan of Rosemary Ellen Guiley’s books practically since I first started getting into reading about strange topics and her latest obsession is the Djinn, a malevolent force that was banished by God after the creation of man to another dimension. They talk about the Djinn in the Koran and it’s what eventually we would call in the West, genies. But we’re not talking about I Dream of Jeannie here. She uses the Djinn as sort of a paranormal unified theory, that they’re shapeshifters who are also responsible for UFO sightings, Bigfoot, Shadow People, and more. You ain’t never had an evil shapeshifting friend like me! 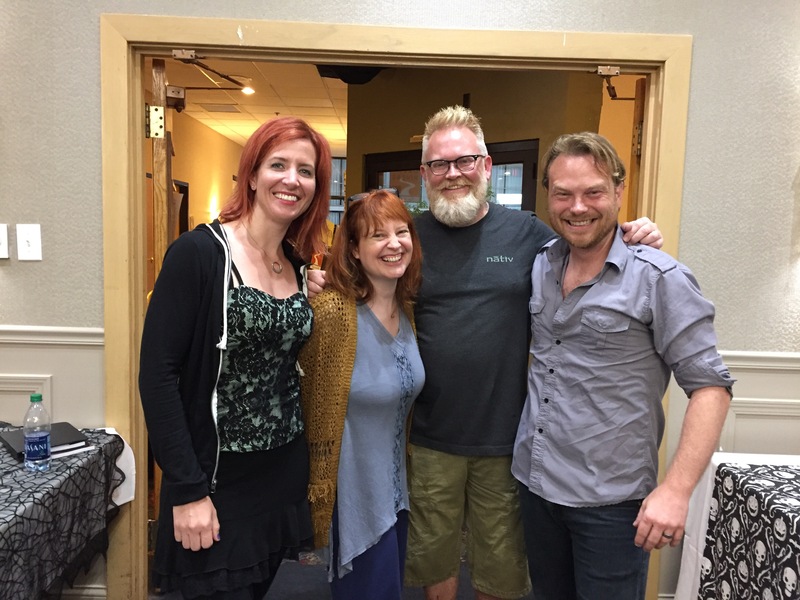 During the breaks, we kept on visiting the Traveling Museum of the Paranormal and the Occult with Greg Newkirk and Dana Matthews of Planet Weird. 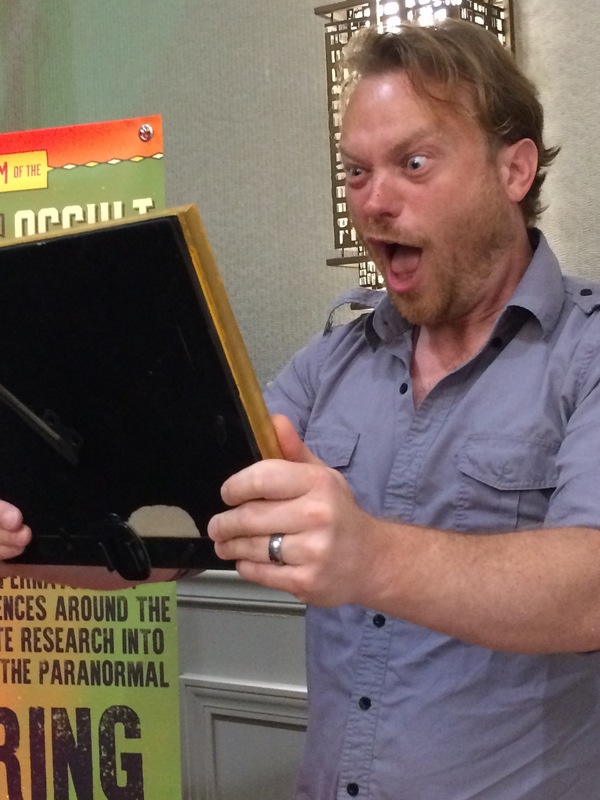 From cursed blades to a terrifying idol they call “Billy”, to a strange cursed Appalachian totem and a haunted Ouija board planchette, the museum was a lot of fun and I can’t wait to bring them on the show. One of our favorite objects was the black mirror, that people say if you stare into it, you’ll start getting dark thoughts. So, of course, we had to take a look! Wendy looks into the cursed Black Mirror and can’t believe what she sees! After lunch, Troy Taylor came up with his writing partner, Rene Kruze, and he talked a little bit about some of his favorite investigations. It was fun to listen to a master storyteller at work and talk about some of his weirdest encounters. Troy, having founded the Alton ghost tours, is of course a man after my own heart and he also doesn’t trust orbs in ghost photos, so we really have something in common! Scotty Roberts from the Paradigm Symposium then gave a presentation on his own paranormal experiences in Egypt, while also getting into who might be perhaps the historical Moses. There’s a great article right here where he goes into some depth on who he feels might be the real Moses and it gave some fascinating background on a personal experience that he later had at that man’s tomb. After Scotty, it was Sherri Blake from Haunted Heartland Tours talking about the Trans-Allegheny Lunatic Asylum in Weston, WV and the history of a very dark place. She had some great research and pictures and the one photo I wish I could have taken all weekend was the reaction shot of Wendy when she saw a picture of where the surgical icepick goes in during a lobotomy (hint, it’s in your eye socket)! Overall, the Haunted America Conference was a fun couple of days and well worth the 6 hour drive from Madison. 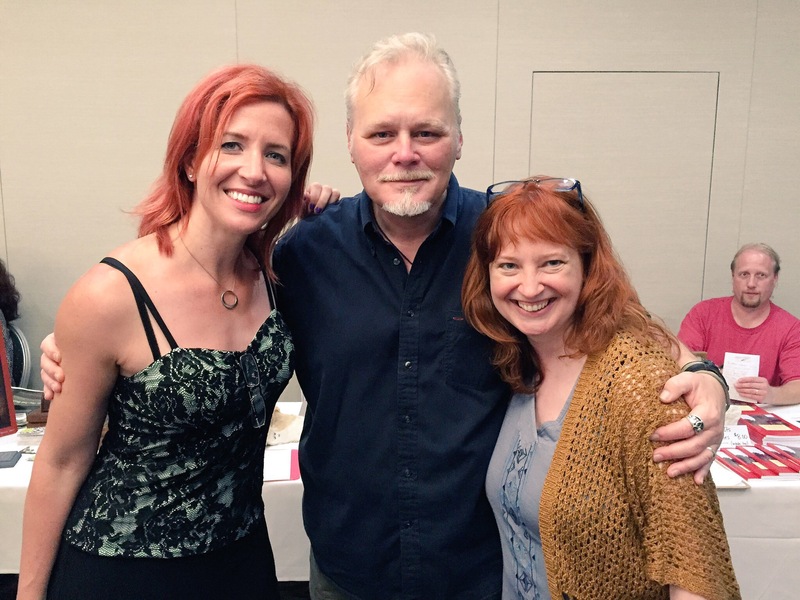 We’re always looking for kindred spirits in the paranormal field (see what I did there?) and we made a bunch of new friends and inspirations for show ideas. One of the most exciting things about conferences is meeting other people with open minds and open hearts when it comes to the mysteries of the universe. It’s easy to forget how amazing and wonderful the world can be and just dwell on the worst aspects. The pointlessness, the boredom, the indifference… the more you focus on those things, the more they rot you from the inside. 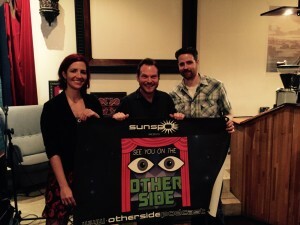 It’s easy to be “Cynical” and that’s the title of this Sunspot track, but it helps when you meet other people who are as excited about the possibilities of this universe as you are. To break my lowered expectations. There is no Hell or Judgment Day. and I’m blinded by monotony. It makes me want to shut my eyes. If I let it get the best there is of me. I will look no more for truth or meaning again. We might as well be hedonistic. This is a guest post by our friend, Jay Bachochin, from WPI Hunts The Truth. 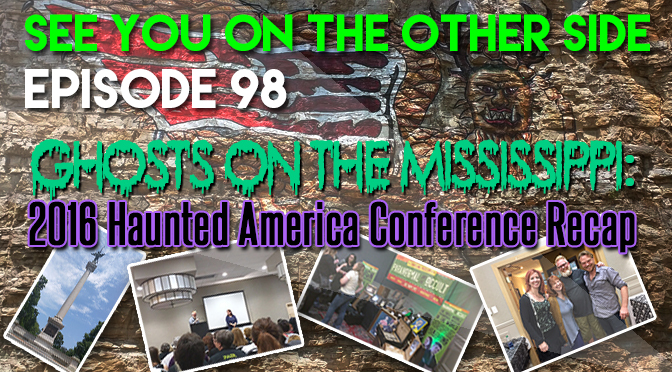 We’ve talked with Jay about the mysterious drownings of young men in La Crosse, Wisconsin, as well as his many Bigfoot investigations. In 2008, he ventured deep into the unknown and dangerous flat land of Wadsworth, Illinois to the burial place of an alleged witch named Mary Worth. For extra credit, we also talk about the origins of the “Bloody Mary” legend in our episode, “Charlie Charlie Can You Play? Supernatural Party Games from Bloody Mary to the Candyman”. Old St. Patrick’s Cemetery is an old cemetery located in Wadsworth, IL that dates back into the 1800’s. This cemetery may be small but it’s potent (see Google Map picture). The supposed resting place of Bloody Mary Worth. You remember her legend don’t you? )You look in the mirror and say her name three times…Bloody Mary, Bloody Mary, Bloody …….. well legend has it a “witch” named Mary Worth owned a farm nearby and tortured run a way slaves during the civil war. She was hung by the locals and she is the supposed origin of Bloody Mary. It may well be just another incarnation of the story ‘Bloody Mary’ but there is a huge filed stone in this cemetery that is believed to be hers. However, there are no burial records for her. If that isn’t enough to raise an eyebrow or get your heart pumping the woods (just to the north west of the cemetery) is what locals call the “Devil’s Pool”. Supposed satanic cults do animal sacrifices at night back there at night. There’s a wooded spot back behind the cemetery, covered in no trespassing signs that is resting place of what the locals call Devil’s Pool. Evidently, according to the local children, satanic sacrifices happen back there. On Saturday, May 10th, 2008, investigators Jay Bachochin and Paul Gasper went tu Old St. Patrick’s Cemetery in Wadsworth, IL to check it out. ******* DISCLAIMER ***** While this investigation happened 8 years ago, the little side park next to the cemetery has since been blocked off with cement barricades and police patrols are very heavy today. Since there wasn’t any signs posted in 2008 of hours of visits, we felt like we were not trespassing. However, surrounding neighbors have grown quite tired of seeing teenagers with flash lights in the cemetery and have asked the help of the Wadsworth Police Department to do frequent drive bys. We do not recommend to try and investigate this cemetery at night. Our investigation began like all new investigators do …. in a cemetery. Since nobody knew who we were there wasn’t any request for investigations so a cemetery was our mission this night. After saying a ‘prayer’ before entering the cemetery we caught an EVP (Electronic Voice Phenomenon) (check out EVP 2 below). 25 seconds after this EVP we caught another (EVP 3). We didn’t know we caught these until the next day during review of our digital voice recorders. We would take several pictures in a row so we could review each one if we caught anything paranormal on camera. In the middle of the cemetery it is complete dark with just a street light far off on the street. As we were walking to the other side of the cemetery I heard something in front of me, maybe just 2 feet in front of me !!! It was a raspy laughter from out of nowhere. It scared the bejesus out of me. (Check out EVP 1 below and hear it yourself!) After getting my bearings we pressed on to take more pictures. So we kept snapping picture after picture after picture without looking at the LCD screen. We figured we’d look at the hundreds of digital pictures the next day. Not much happened after that except the chills of being in a cemetery at midnight. We left the cemetery around 12:45 a.m. and reviewed the audio and photos the next day. What we found on the photos we took defied logic and quite frankly validated a lot of ghostly claims. 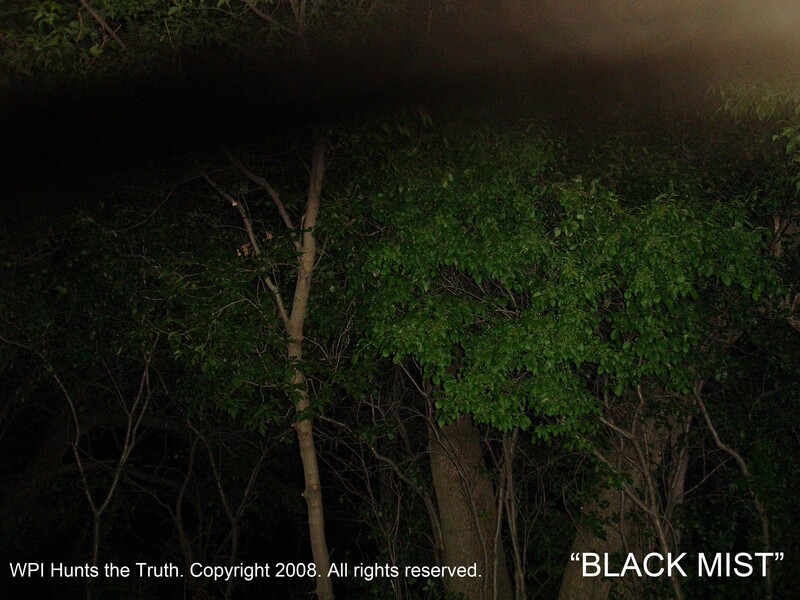 Black Mist Photo: What intrigued us the most about this photo is that we couldn’t figure out what it was. Maybe the blackness was the brim of my hat in front of the camera lens somehow? No, it couldn’t be because you can see the green leafs at the top of the photo. The brim of a hat would cause total blackout. Could it have been a blur from movement where I caught my finger or hand somehow? No, it couldn’t be because everything else on the photo is crisp and clear. So what is it? Something moved in front of our camera lens unnoticed and we have no way to prove or disprove what this was. 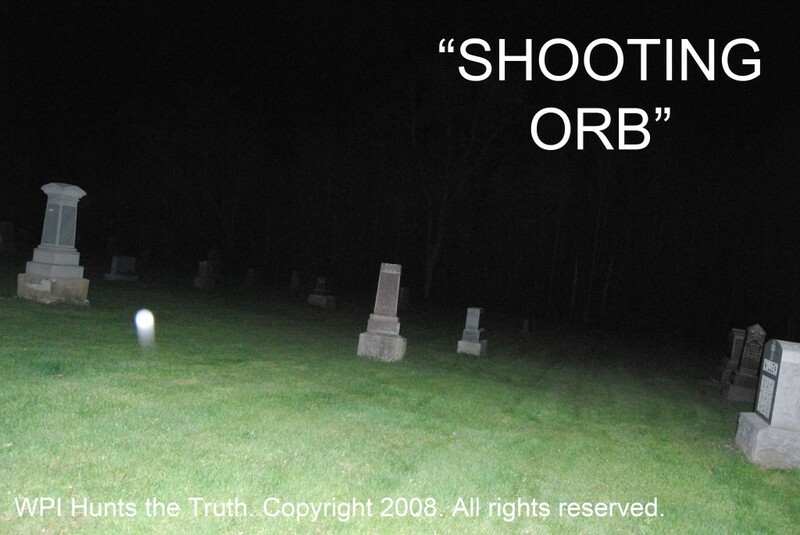 Orb Photo: What is a ghost orb? You may have seen them in your own photos. Sometimes large, sometimes small and sometimes there are multiple transparent orbs. Most likely, those orbs are a false positive. A false positive is that the orb is actually debris such as dust, dirt, moisture, sun flares, the list goes on and on with natural causes. However this night we captured the logic defying flying orb. It’s solid white sphere with a white tail showing you it’s moving. So what is an orb? 99.9999% is a natural piece of debris obstructing the lens with a flash. The .0000001% is paranormal in nature. 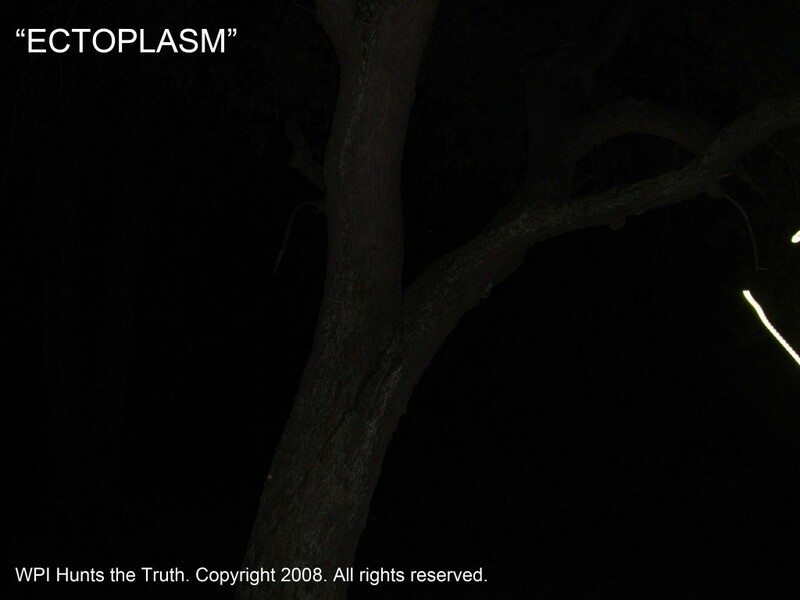 Ectoplasm Photo: What intrigued us about this photo is the little loop-de-loop electro discharge on the right hand side of the photo. We couldn’t debunk this as hair for I have short hair. Could it have been the tether of my camera? No, since I removed the tether 12 months earlier. So what else could this phenomenon of a glowing worm be? WPI Hunts the Truth was established in March 2007 by Jay and Katie Bachochin due to their love and passion of the paranormal. 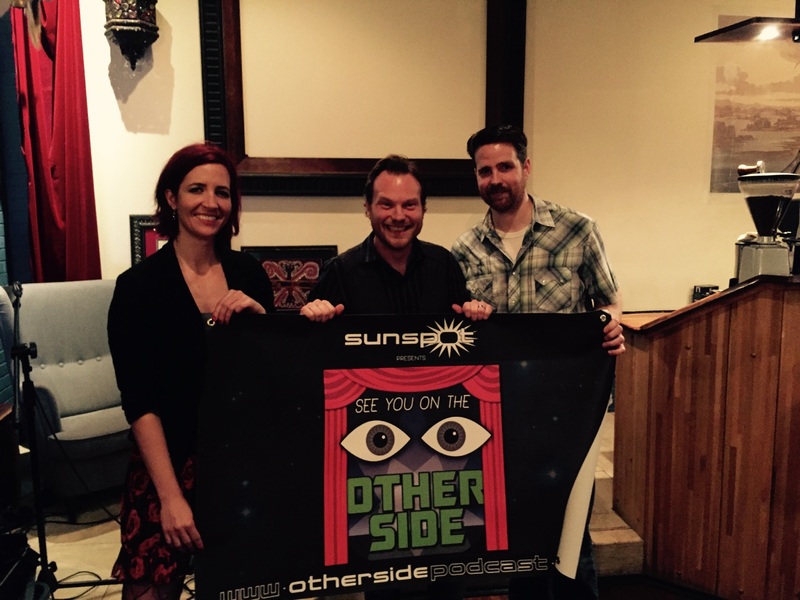 Jay and Katie were both so intrigued by the paranormal evidence they’ve seen in their lives. Ghosts, UFOs and Unknown Creatures. We took an interest in researching as a husband & wife team in 2006″. In later March 2007, they founded The Wisconsin Paranormal Investigators while networking with some friends that shared the similar passion. They all believe there is more to their everyday normal lives. Do ghosts really exist? Are those lights in the sky just a plane? Is there really an 8′ tall undiscovered primate hiding from everybody? Is all this simply suggestive thought or mass hysteria? They needed to find the answers for themselves and share what they knew with other like minded researchers. This is how their mission Hunt the Truth was born. They combined their organizations acronym and their mission statement to simplify who they are and what we do. Jay and Katie are WPI Hunts the Truth. Please visit their website, find them on Facebook or send them an email if you’d like them to help with your investigation.